I just learned that Copenhagen’s Metro was voted the best subway in the world at the Metro Rail conference this year. The Copenhagen Metro is a super transport system and since we live right next to a stop, I must say it does make our lives easier when we want to get into the city without a car. It’s driverless and automated, runs quietly and is still relatively clean not to mention sporting a sleek design. What else would you expect in the world capitol of design and elegant aesthetics? However! During its first three years of operation, the Metro was responsible for me waiting for extreme periods with no information provided, not to mention being late and not able to get home in a timely fashion. It was so ridiculous how many delays there were that we stopped using the Metro. I just find it extremely amazing that now, just a couple short years later, it’s voted “best in the world.” Obviously they are not taking its track record into account. It is fast and efficient when it’s working, yes. But it hasn’t been without its share of teething problems. Also, just to point out that there was mention that the Copenhagen Metro was voted by experts from other metros like New York, Tokyo and London. I have a hard time understanding how these metros can be seen in the same ball park. It’s a little like comparing the choo-choo train in Tivoli with the high-speed rail of the Euro Star. I mean no disrespect at all because as I said, the Metro is a terrific public transport system when it’s working properly. And since I personally had so many bad experiences, I felt the need to express this. I’m just glad that they were able to sort out the problems and impressed that have achieved this accolade. Obviously they have been able to correct it, which after that many years of problems is a major accomplishment. So, congratulations Copenhagen Metro, it looks like you are growing up! I guess with any start-up it’s got to iron out it’s kinks. I personally never experienced a problem. I used to take it back in 05 for several months when I worked at Fields. Unfortunately I don’t have that much experience with worldwide subway systems, but I have to say, despite it’s problems in the beginning it has been more efficient in my opinion than say… New York, London and Paris metro systems. New York is horrible. After over 100 years of Operation and a fleet of new trains and fare hikes you’d think there would be improvement. No scheduling. You never know when the next train is coming. It’s generally gross in the stations, even in the new and improved ones. Unacceptable waiting periods. Last minute route changes. Horrible P.A. system. I realize there’s a severe population difference, but still. Wash DC and Chicago are a bit better. London was unbearable in summer, but still more efficient. All in all, at it’s worst I would have to say that in my own experience the metro has been a dream. 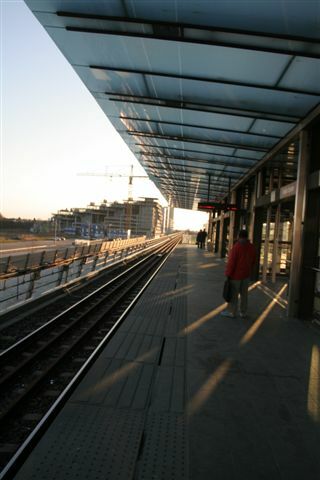 open Sol station in the city center,will be Europe’s largest. Washington,D.C. also has an outstanding system,albeit not as extensive as Madrids’. ← What’s New in Denmark?